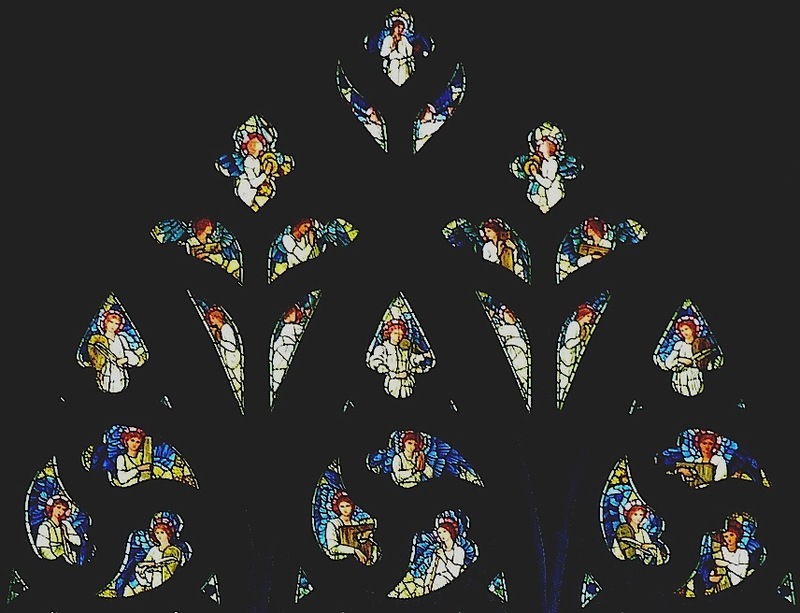 East window, with designs by Sir Edward Burne-Jones (1833-1898). 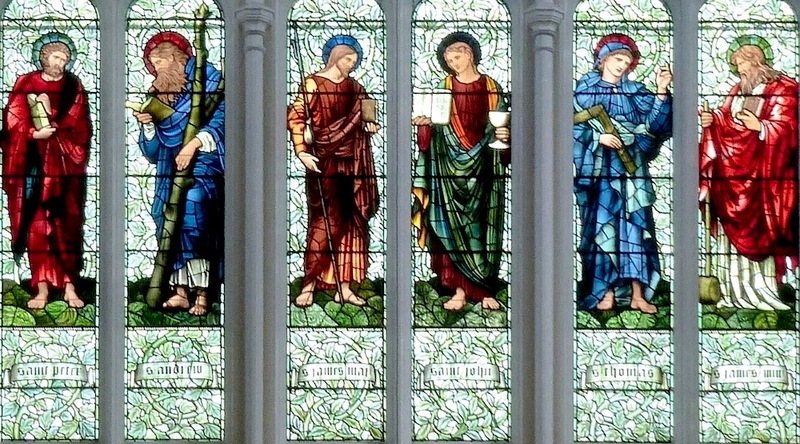 Made by Morris & Co., this window was installed in Burn & Bryce's St Mary's Parish Church, Dundee, in 1897. Most of the figures are to designs of the 1870s. The exceptions are the figures of St. Matthew and St. Paul, which were designed in the 90s, and the figure of St. Bartholomew, designed by William Morris himself in 1865 (Gifford 91-92). The tracery lights depict angels with a whole variety of instruments — "as suggested in Psalm 150" ("Dundee Parish Church"). Upper row, left to right: St. Peter, St. Andrew, St. James Major (the Greater), St. John, St. Thomas and St. James Minor (the Lesser). Lower row, left to right: St. Philip, St. Bartholomew, St. Mathew, St. Simon, St. Jude and St. Paul. 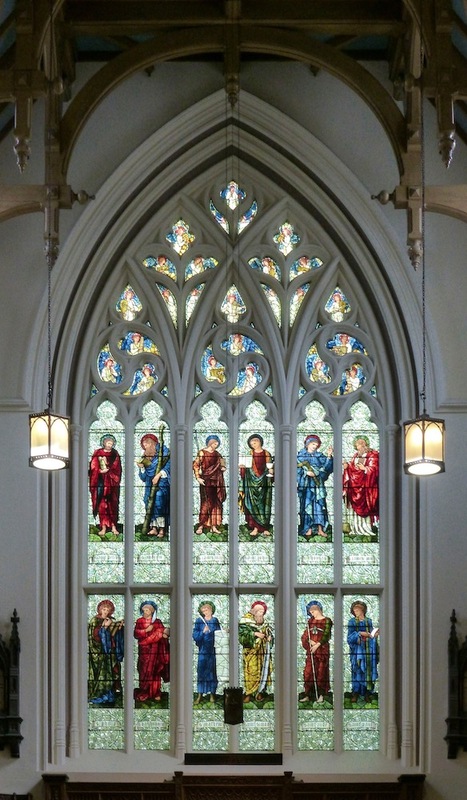 The window was given by Hugh Ballingall and William Brown Robertson to commemorate the Queen's Diamond Jubilee in 1897 ("Dundee Parish Church"). Dundee Parish Church (St Mary's) Photo Tour." Dundee St Mary's. 1 December 2016. Gifford, John. Dundee and Angus. The Buildings of Scotland series. New York and London: Yale University Press, 2012.